Bring your favourite musicians into your home! Experience concerts in comfort: lying in bed with your laptop, watching a concert and chatting with the performer or with other viewers! All that on Monday evenings starting around 9pm. Tickets are sold at the end of this page. You're not bound to any particular concert, but have complete freedom of choice. With the subscription, you simply purchase 10, 5 or 1 access code, with each of which you can view one concert. Please refer to our regular newsletters for the upcoming concert dates. How does it work? / F.A.Q. 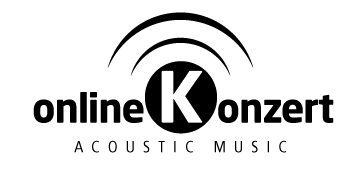 Online Concerts - as a gift voucher!